Southern Energy and Resilience | Appealing to Southlanders to honestly consider the future. I heartily agree with Richard Soper [October 29] that Environment Southland is “not a green pressure group”. Clearly that label cannot apply either to the Rockefeller Brothers Fund, the Norwegian Sovereign Wealth Fund, etc. Oil is rapidly becoming an uneconomic option and divestment is actually the prudent economic decision. Responsible institutional investors globally are weighing the evidence and making the choice on an economic and moral basis. Right now, the oil industry is being driven to a crisis point by the combination of restricted cash flow due to depressed oil prices, and declining return on investment from (ever harder to access) new reserves. Well before the current low prices prevailed, oil majors were issuing profit warnings, and performing desperate accounting manoeuvres such as share buy-backs to sustain their investor’s yields. BP, Shell, ConocoPhillips, Saudi Arabia, are all in major trouble, with investors calling for capital restraint. Witness also the fracking ponzi schemes unravelling in the USA, where investors promised high returns have been continuously disappointed. Additionally, the global economy appears to be sinking further into a deflationary spiral, which may well serve to depress oil prices further, worsening the crisis as noted recently by Goldman Sachs. The coming oil supply crisis that this inevitably leads to is a major risk to our entire economy here in New Zealand. Investing in risk reduction in this context, preparing our community for an energy and capital constrained future, would be a far better use of our capital. This would show they are taking the welfare of our children, and our children’s children seriously. We desperately need to get serious as a community, nation and species, about the need to leave oil before it leaves us! Transition to 100% renewable energy? Sure. Maintain current levels of growth and consumption? Not gonna happen. Note this doesn’t mean that we shouldn’t roll out as much renewable energy generation as we can… It’s just that the lower ‘energy profit’ from creating renewable energy machines and processes, relative to fossil fueled ones, means that the ‘net energy’ left after gathering the energy resource is so low that it won’t allow us to continue the rate of material throughput our industrial civilisation requires to function in its present form. There’s also the issue of non-substitutable uses of liquid fuels for heavy transport vehicles, and many other considerations. View the book’s authors presenting on the report, go to this link. NZ refrigerated food exports get a mention in the discussion of decarbonising the food supply chain in this segment of the presentation. For a very encouraging, up to date as at June 2016 presentation about ‘The Winning of The Carbon War’ by Jeremy Leggett, click here. The playing field is shifting fast! This is based on my understanding from the High Intensity Rainfall Dataset from NIWA http://hirds.niwa.co.nz/hirds_data/Invercargill%20/NZMG/5411541/2152696/2,4,6/IFD which also demonstrates how rainfall intensity will increase with increased mean air temperatures. Just carrying on with a particular design standard, especially one that is below the NZS recommendation from 2010, and just ‘because it’s been done like this for 30 years’ is in no way defensible in the face of the challenges that Climate Change (and other ‘Planetary Boundaries’) and resource depletion (as I outlined in my submission to the council’s Long Term Plan last year: bit.ly/1BJBHqL) pose to our current way of life. The predicted effects of climate change will be very difficult to deal with, and I have sympathy for ICC’s predicament with regard to how and where to expend the ratepayers capital effectively, it’s a very hard problem… It also mirrors the more general predicament we all face, which is that what has worked in the past is no longer working in many respects, and this situation will only worsen over time. These are symptoms of biophysical Limits to Growth that we face, and are an issue I continue to work with the Wise Response society to publicise to the general public. The New Zealand parliament would do well to form something similar to the UK’s All Party Parliamentary Group. Even though central government isn’t taking these things seriously, local and regional government can and should act to educate itself and others on the implications and positive responses. My submissions aim to assist this process. Ref: SUBMISSION – Bylaw 2016/1 –CODE OF PRACTICE. I wish to be heard by the Councillors and Mayor in support of my submission. My submission to the council’s draft LTP (http://bit.ly/1BJBHqL) last year identified 3E’s – Economics, Energy, and Ecology that will shape the solution spaces available to us as a city. NZS 4404:2010 is designed for ‘Green Streets and Livable Communities’ (Hall http://bit.ly/1NrLSpR). As Prof Susan Krumdieck (University of Canterbury – http://bit.ly/1NrLTdc), Prof Charles Hall (http://stanford.io/1yifujq) and other leading academics and industry specialists are communicating, declining Energy Return On Investment ‘EROI’ for our fossil fuel supply means we will have to work within a much reduced energy budget. This is quite aside from the imperative to reduce industrial pollution such as CO2 emissions to prevent negative ecosystem impacts. 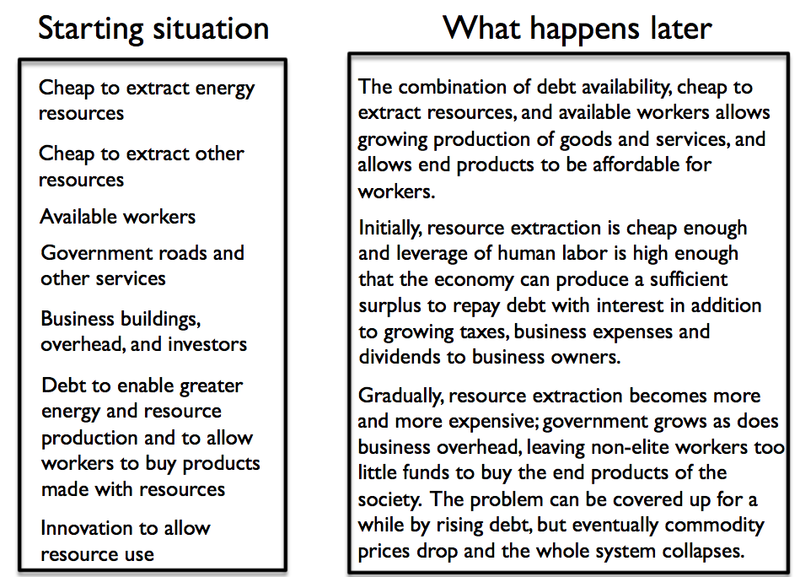 Both of these limitations on future activity come at a time when the economic ponzi scheme that has created mostly cheap credit (in financial terms) since the dropping of the gold standard in the 1970’s is ‘topping out’, leading to a potentially quite prolonged period of stagnation as limits to credit expansion are reached and breached globally. We will have no option but to work within the much reduced number of ‘solution spaces’ that this confluence of issues leaves open to us in subsequent decades. This will require us to change substantially the narrative we live by, the story we tell ourselves of who we are. This change from a ‘Sacred Money and Markets’ story, to a ‘Sacred Life and Living Earth’ story, over time, in response to the limits imposed on us by our finite planet, will alter radically the trajectory we are currently on. It will give us cause to explore significantly different urban forms, which I mention as ‘Agrihoods’ or villages (even within the city’s current boundaries), to use the more mundane title. This was the subject of a recent 15 minute presentation I gave recently at an Innov8 Invercargill event (presentation http://bit.ly/1pWlsXS and a voice recording: http://bit.ly/1MiV70h). 1.9 Bonds and charges – Amend clauses as below 1.9.1 Uncompleted works 1.9.1.3 The amount of the bond shall be 150% of the estimated value of the uncompleted work or a value agreeable to the TA plus a margin to cover additional costs estimated to be incurred by the TA in the event of default. Who is to be the arbiter of what is ‘agreeable to the TA’? How are the public supposed to comment on this proposal if no indication of the potential size of the financial impact (as a percentage of the estimated value, for example) is given? Does it introduce the potential for restrictions to developments proceeding? I propose this amendment be removed from the code of practice document, as it gives the potential for a perception of restrictive amounts being demanded arbitrarily, or for political or anti-competitive reasons. The changing of the minimum road widths to 3 and 6m from the recommendation in the NZS is going to cost the rate payer an additional 8% (approximately; 5.5/6=0.9167) for the upkeep and maintenance of future roads developed which are vested with the council. I understand that wider roads are seen as a feature of the city, giving it a different character. The historic basis as I understand it was the turning circle of a horse drawn cart.. There are clear trends in car ownership, and particularly future cost rises in the price of ashphalt, reductions in vehicle ownership through passenger vehicle automation, declining affordability / availability of fuel due to resource depletion, etc . For future developments, given these undisputable trends, please provide rationale as to why the council is proposing this amendment? The following is to be added to the end of the clause. Please provide reference as to the origin of this formula. If it wasn’t included in the NZS, why does the council feel it necessary to insert it? Without rationale for this change, how can the proposed amendment be assessed by a member of the public? (I’m aware that a google search provides answers like these: http://www.lmnoeng.com/Hydrology/rational.php – I’m pointing out the poor quality of the consultation document). All new primary stormwater systems shall be designed to cope with climate change adjusted design storms of at least the annual exceedance probability (AEP) set out in table 4.1 unless specific approval has been obtained from the TA. with a 20% annual exceedance probability (AEP), a 20% AEP design storm has a return period of 5 years. All new secondary systems shall be designed to cope with 1% AEP (100 year return period) design storms. It is unclear, to say the least, why the council is choosing to go from “at least 10% (where no secondary path exists)”, to only “20%” of the AEP in this proposed amendment. As I pointed out in my submission to the ICC LTP last year, rainfall intensities are set to increase, due to the increased moisture carrying capacity of a warmer climate. One possibility that comes to mind is that the council has decided to accept the reality of having to abandon large parts of the city to climate change induced sea level changes within the next 50-100 years, and is willing to reduce the infrastructure provision to induce localised flooding events to incentivise people to move, and reduce its drainage expenditure. Why specifically did they choose to go to a higher probability, lower impact event, which is the opposite direction to other TA’s such as QLDC (below), Hamilton, and probably others? Replace what clause with the following!!! How are we supposed to comment on this? …based on 0.7 litre/second/hectare (l/s/ha). As I noted in my comments to the LTP last year, the council should consider rainwater collection as a serious alternative to mains water supply, and as a future resilience upgrade for the city, which could be encouraged in the place of the proposed secondary water supply for the city that is included in council plans elsewhere. I do not accept the council’s rationale for dismissing my proposal in its response to by submission on a fire fighting basis as other cities in drier parts of NZ that have adopted this approach have clearly considered this, and found a way around it. In line with other TA’s globally, recognising the threat to their citizens from sole reliance on the supermarket infrastructure and gardening for food supply, I request that the council consider introducing an incremental experiment with edible planting for the parks department. Allocate an initial 5% of the planting budget for an experiment with edible planting, and increase this yearly, as species and locations that ‘work’ in the local context are identified. Consider putting an emphasis on edible planting for new residential developments, and limiting grass as a percentage of total section size, as is currently done with hard cover % to stabilise drainage. This would also go some way to reducing the issue I raise regarding the 20% AEP above, as planting for perennial and annual edibles increases soil porosity and organic matter content relative to grass cover, reducing runoff. Perhaps insert something into 7.2.1 Approval regarding this? Due to the inadequate time available, I have been unable to review this document past page 36. I will try to find time over the weekend to make some brief comments on this, which I will submit as an addendum to this submission. Our economy is like a pump that works increasingly slowly over time, as diminishing returns and other adverse influences affect its operation. Eventually, it is likely to stop. As nearly as I can tell, the way economic growth occurs (and stops taking place) is as summarized in Figure 3. As long as (a) energy and other resources are cheap, (2) debt is readily available, and (3) “overhead” in the form of payments for government services, business overhead, and interest payments on debt are low, the pump can continue working as normal. As various parts of the pump “gum up,” the economic growth pump slows down. It is likely to eventually stop, once it becomes too difficult to repay debt with interest with the meager level of economic growth achieved. Commodity prices are also likely to drop too low. This happens because the wages of workers drop so low that they cannot afford to buy expensive products such as cars and new homes. Growing purchases of products such as these are a big part of what keep the economic pump operating. 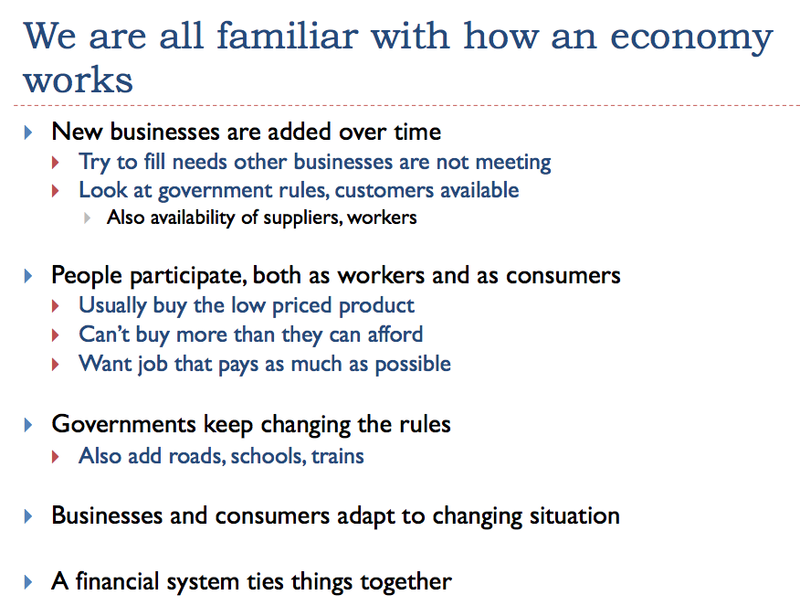 Our economy is a networked system. I have illustrated it as being similar to a child’s building toy. Ever-larger structures can be built by adding more businesses and consumers, and by using resources of various kinds to produce an increasing quantity of goods and services. Following last night’s post, I come across this in my blog feed today! Serendipity!! Chris Harries, a follower of this blog, has found an amazing pdf file on XRayMike’s blog that is so amazing, and explains civilisation’s predicaments so well, I just had to write it up for you all to share around. I think that the concept of the Earth as a chemical battery is simply stunning…….. the importance of this paper, I think, is epic. World renown techno-utopian idealist, and singularitarian, Tony Seba was recently brought to Southland by Venture Southland and Callaghan Innovation to talk to business leaders about the current rate of change in technology and how this is a highly disruptive force to be reckoned with… I didn’t attend the rather expensive seminar, however I do keep coming across links to his talks, etc. Having said that, the type of disruption that Tony envisages, IF we can keep our techno-industrial civilisation going in the face of declining net energy available, and through the upcoming GFC MK2 (which again is partially attributable to declining energy profit as a root cause http://bit.ly/1Ips07m) would certainly help with sustainability in any foreseeable future. 2.) Solar and EV’s is not liquid fuel for transport, and there are no electric mine trucks, HGV’s, etc as the battery tech is not good enough. You could say well we can at least electrify personal transport, and you’d be right, but we can’t do this for heavy goods vehicles, which comprise 40%ish of NZ’s fuel consumption (See page 25: http://bit.ly/1VIF5OP), and all of the inputs that industry across the globe relies on to produce all the tech that we use the electricity to power. 4.) All hydro electricity generation in NZ is only 14.5 kWh/person/day (84.2 PJ/annum 2012 figures from IEA: http://www.iea.org/Sankey/index.html#?c=New Zealand&s=Balance) and in the same year our energy consumption for transport from fossil fuel was 32.6 kWh/person/day (189.6 PJ/annum), never mind that the hydro generation capacity is mostly spoken for for other uses. 4433000 population => 32.55 [kWh/person/day] for Transport energy use. As oil prices have slumped over the last few years due to both the shale gas and Saudi oil gluts, the decline in profitability has forced oil majors to slash investments and shut down costly operations. US industry experts now forecast that these events are setting the world up for an oil price spike, which could begin in the next six months to two years. There can be little doubt that the US government is aware of the industry’s fears. Robert Hirsh, a former senior energy programme advisor for government contractor Science Applications International Corporation, wrote a major report on peak oil for the US Department of Energy in 2005. He predicts a likely global oil shock by 2017, accompanied by a stock market crash, inflation, and unemployment. He also points out that the Pentagon recognises the risk. As oil production decreases due to the cost-cutting contraction of industry operations, along with declines from aging fields, the International Energy Agency predicts an increase in demand growth by the end of this year. As demand rises, the question is how quickly existing oil and gas wells can increase global output in the face of this rapidly diminishing spare capacity. The answer is not very. Over the next two years, around 200 major international oil and gas projects have been scheduled for final investment approvals. But due to the price collapse – and with it the collapse in profitability – the vast majority of them face postponement, or cancellation. According to Tim Dodson, executive vice president for exploration at Statoil ASA, the industry is “struggling big-time to replace their oil resources and reserves”. This is part of a wider pattern over the last decade. Oil majors like Royal Dutch Shell, British Petroleum, ConocoPhillips, ExxonMobil and Chevron have all seen their production fall year-over-year by 3.25 percent. Oil and gas extracted last year has not been replaced by new reserves. The business model of the shale gas industry is so shaky, according to legendary US hedge-fund manager James Chanos, that when prices do rebound as demand growth hits the limits of declining supply, the oil majors will still be in trouble. With insufficient oil available amidst a price rebound, markets will be massively incentivised to flee expensive fossil fuels, empowering cheaper, alternative energy forms. Oil majors, still facing high production costs and huge debt obligations, will have to grapple with further borrowing to kick-start costly investments in new production projects. But in the corresponding climate of a new economic recession triggered partly by oil price spikes, how likely is this? Five years ago, Maxwell told Forbes that “around 2015, we will hit a near-plateau of production around the world, and we will hold it for maybe four or five years. On the other side of that plateau, production will begin slowly moving down. By 2020, we should be headed in a downward direction for oil output in the world each year instead of an upward direction, as we are today”. That prediction in 2010 appears to be transpiring today. “The combination of increasingly difficult-to-extract conventional oil combined with depleting super-giant and giant oil fields, some of which have been producing for 7 decades, has led the International Energy Agency (IEA) to declare in late 2010 that the peak of conventional oil production occurred in 2006 (IEA, 2010). Conventional crude oil makes up the largest share of all liquids commonly counted as “oil” and refers to reservoirs that primarily allow oil to be recovered as a free-flowing dark to light-colored liquid (Speight, 2007). The peak of conventional oil production is an important turning point for the world energy system because many difficult questions remain unanswered. For instance: how long will conventional oil production stay on its current production plateau? Can unconventional oil production make up for the decline of conventional oil? What are the consequences to the world economy when overall oil production declines, as it eventually must? What are the steps businesses and governments can take now to prepare? In this paper we pay particular attention to oil for several reasons. First, most alternative energy sources are not replacements for oil. Many of these alternatives (wind, solar, geothermal, etc.) produce electricity— not liquid fuel. Consequently the world transportation fleet is at high risk of suffering from oil price shocks and oil shortages as conventional oil production declines. Though substitute liquid fuel production, like coal-to-liquids, will increase over the next two or three decades, it is not clear that it can completely make up for the decline of oil production. Second, oil contributes the largest share to the total primary energy supply, approximately 34%. Changes to its price and availability will have worldwide impact especially because alternative sources currently contribute so little to the world energy system (IEA, 2010).Oil is particularly important because of its unique role in the global energy system and the global economy. Oil supplies over 90% of the energy for world transportation (Sorrell et al., 2009). Its energy density and portability have allowed many other systems, from mineral extraction to deep-sea fishing (two sectors particularly dependent on diesel fuel but sectors by no means unique in their dependence on oil), to operate on a global scale. Oil is also the lynchpin of the remainder of the energy system. Without it, mining coal and uranium, drilling for natural gas and even manufacturing and distributing alternative energy systems like solar panels would be significantly more difficult and expensive. Thus, oil could be considered an “enabling” resource. Oil enables us to obtain all the other resources required to run our modern civilization. “We are running short of options for fixing our low commodity price problem. The ideal solution to our low commodity price problem would be to find substitutes that are cheap enough, and could increase in quantity rapidly enough, to power the economy to economic growth. “Cheap enough” would probably mean approximately $20 barrel for a liquid oil substitute. The price would need to be correspondingly inexpensive for other energy products. Cheap and abundant energy products are needed because oil consumption and energy consumption are highly correlated. If prices are not low, consumers cannot afford them. The economy would react as it does to inefficiency. These substitutes would also need to be non-polluting, so that pollution workarounds do not add to costs. These substitutes would need to work in existing vehicles and machinery, so that we do not have to deal with the high cost of transition to new equipment. Clearly, none of the potential substitutes we are looking at today come anywhere close to meeting cost and scalability requirements. Wind and solar PV can only built on top of our existing fossil fuel system. All evidence is that they raise total costs, adding to our “Increased Inefficiency” problem, rather than fixing it. Besides adopting QE starting in 2008, governments also ramped up their spending (and debt) during the 2008-2011 period. This spending included road building, which increased the demand for commodities directly, and unemployment insurance payments, which indirectly increased the demand for commodities by giving jobless people money, which they used for food and transportation. China also ramped up its use of debt in the 2008-2009 period, building more factories and homes. The combination of QE, China’s debt, and government debt brought oil prices back up by 2011, although not to as high a level as in 2008 (Figure 7). More recently, governments have slowed their growth in spending (and debt), realizing that they are reaching maximum prudent debt levels. China has slowed its debt growth, as pollution from coal has become an increasing problem, and as the need for new homes and new factories has become saturated. Its debt ratios are also becoming very high. QE continues to be used by some countries, but its benefit seems to be waning, as interest rates are already as low as they can go, and as central banks buy up an increasing share of debt that might be used for loan collateral. The credit generated by QE has allowed questionable investments since the required rate of return on investments funded by low interest rate debt is so low. Some of this debt simply recirculates within the financial system, propping up stock prices and land prices. Some of it has gone toward stock buy-backs. Virtually none of it has added to commodity demand. Why are commodity prices, including oil prices, lagging? Ultimately, it comes back to the question, “Why isn’t the world economy making very many of the end products that use these commodities?” If workers were getting rich enough to buy new homes and cars, demand for these products would be raising the prices of commodities used to build and operate cars, including the price of oil. If governments were rich enough to build an increasing number of roads and more public housing, there would be demand for the commodities used to build roads and public housing. Southern Energy and Resilience · Appealing to Southlanders to honestly consider the future.